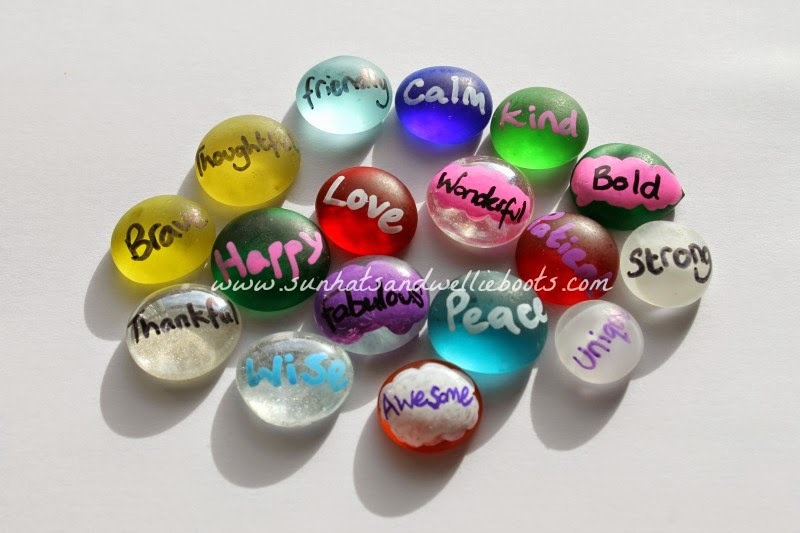 These colourful affirmation stones offer a simple & effective way to build some positive thinking & confidence into a child's daily routine. Each stone carries a reassuring affirmation & is the perfect size for children to slip into their pocket so they can keep them with them throughout the day. How many times have you heard a child say to themselves they're no good at something, or they're not clever enough, & they subsequently leave & move away from the task they're working on? So often those negative thoughts can smash their confidence in their own ability & it becomes a self fulfilling prophecy, but by offering these stones as something to focus on they have a chance to redirect their thoughts & create a more positive outcome. 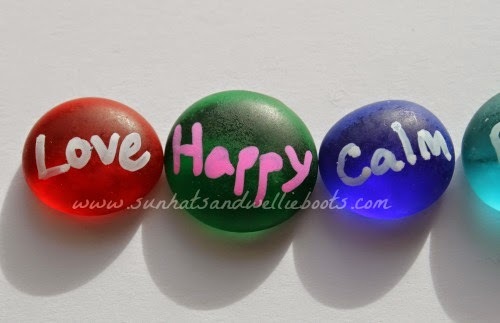 To make them we used colourful glass nuggets (widely available online) & a selection of Sharpie markers. I wanted each affirmation to be clear & easy to remember so I just added one simple word to each stone using the Sharpie pens. 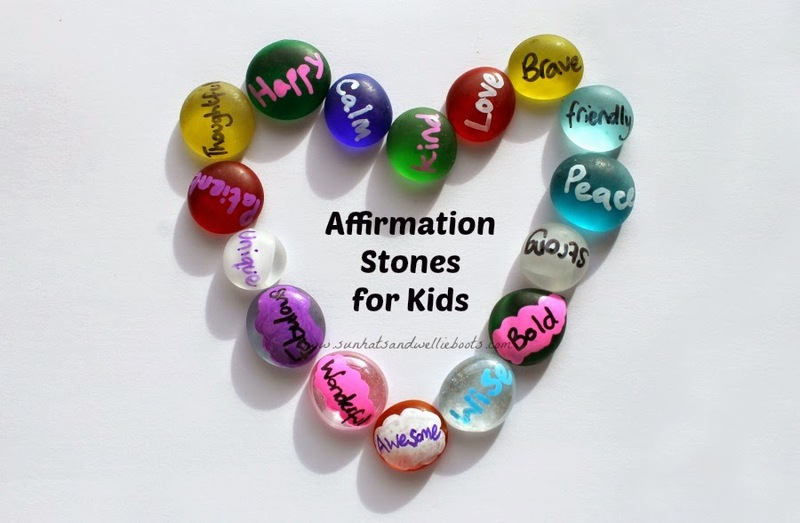 You could add any number of affirmations to the stones & choose different ones to suit your child's situation. If you have a particularly anxious child you may want to add more calming, peaceful words, or if you have a child who struggles with their confidence, maybe affirmations focusing on strength, positivity, & uniqueness would be more helpful. Once we'd added the affirmations we collected our stones together & noticed how beautiful they were especially when the sunlight caught them giving them a real glow. There's something soothing about the texture of these smooth, cool stones too as you hold them in your hands. 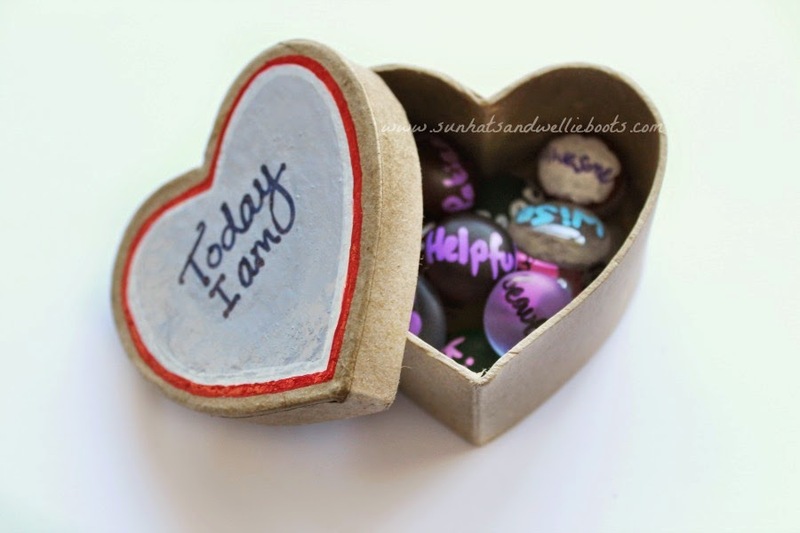 To keep our set of affirmation stones safe we decorated a heart shaped box that we put aside to use only for these stones. I decorated the lid with "Today I am..." & Minnie personalised the base of the box later with her name & a few sparkly sequins. By designing a special box for the affirmations we were acknowledging their value & that they needed to be kept safe. 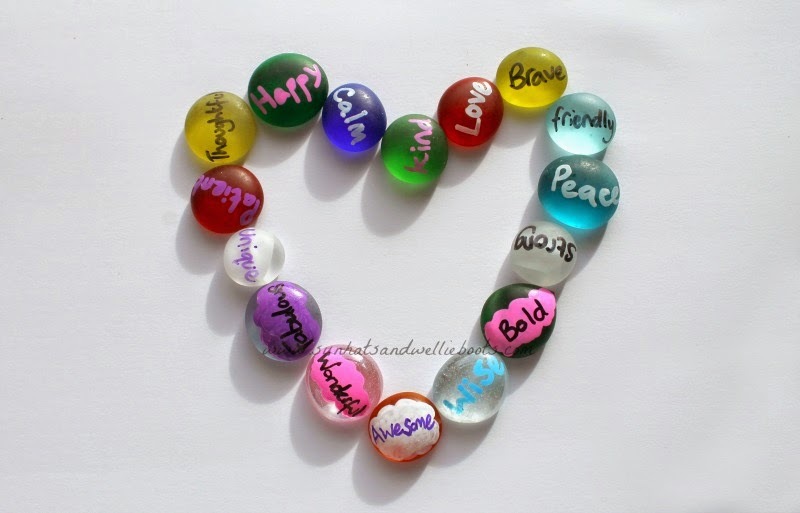 There are a number of ways these affirmation stones can be used, but we have found the following to be a real help in our daily routine. 1. Each morning invite your child to randomly pick one of the stones from the box. 2. Encourage them to read aloud the word written on that stone, this becomes their affirmation for the day. 3. 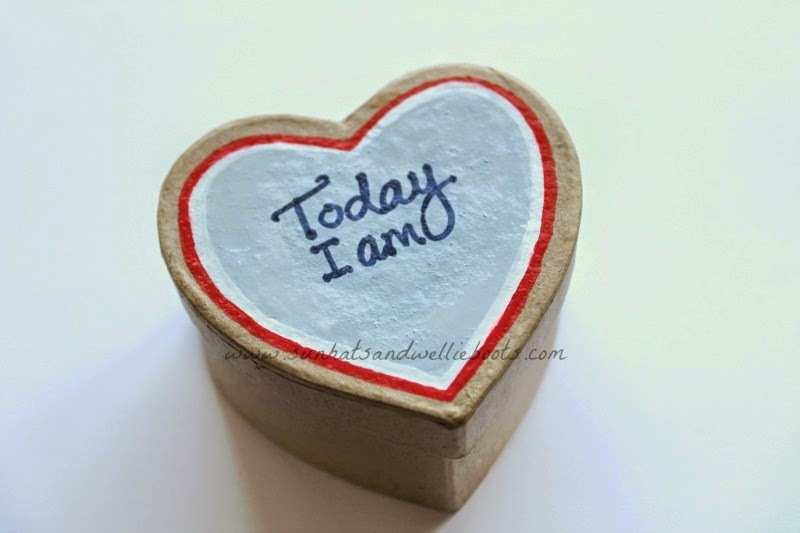 To help them visualize & focus on their positive message they can place the stone on the lid of the box & again read "Today I am...". Using "I AM" at the start of the affirmation creates a bold empowering statement for a child, focusing on what is achievable, rather than what is not. Also by using a present tense they begin to create the outcome now. 4. To remind them of their daily affirmation the child can slip the stone into a pocket / school bag, & know they have it alongside them for the rest of the day. 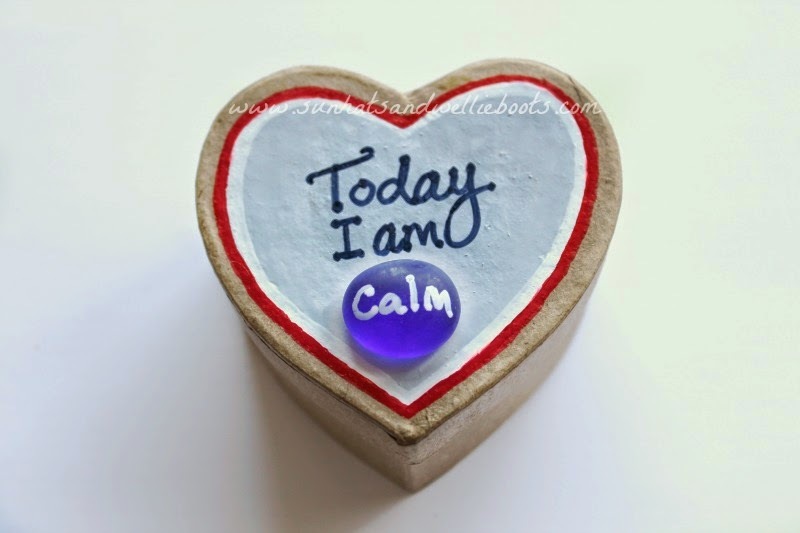 This can provide reassurance, especially if they feel anxious or upset at any time, & simply by placing their hand in their pocket & holding their affirmation stone they are reminded of the positive message. 5. At the end of the day before they go to bed encourage your child to hold their affirmation in their hand & read it again saying "I am ..." before they place the stone back in the box. To help build their confidence you may wish to point out a particular time during that day when you noticed they had been calm/helpful/brave etc. Praising a positive outcome can only be a good thing, & who knows what a difference that may have on their thinking & behaviour. This set of affirmation stones has made quite an impact in our house, & adding them as we have done to our daily routine has offered us as a family a positive & reflective way to start & end the day. I just need to make myself a set now! If you found this useful you might also like our Relaxation Jar, Magical Soothing Spray to Calm Kids, or Worry Monsters.